Really pretty pillow, looks nice on the sofa. The Rizzy Home Floral Throw Pillow is a perfect way to add a pop of color to any decor. 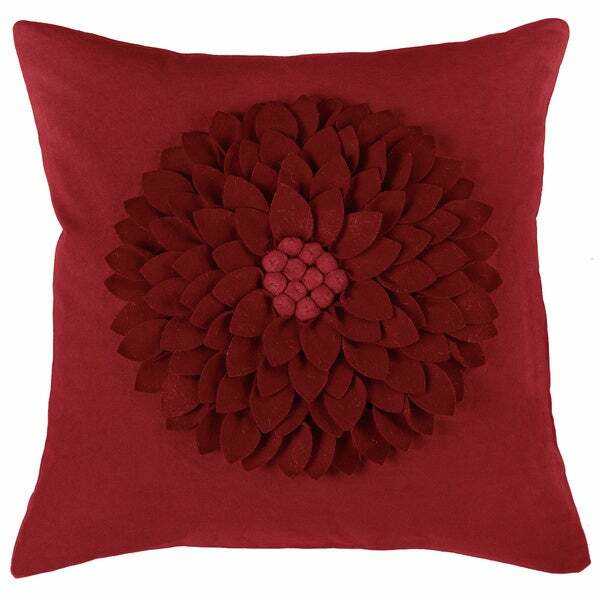 This pillow features a 3-dimensional raised floral design that is sure to look great on any chair or sofa. Option: Maroon - 18" x 18"
The pillow is very nice. It is red on-line. In person it is definitely pink. Going back. Option: Mauve - 18" x 18"
Option: Red - 18" x 18"
This was an addition to my bed to create some bold coloring. This worked very well. The pillow is a nice size and the color in the picture is a perfect match to the product received. Couldn't be happier! Option: Turquoise - 18" x 18"
This is a beautiful teal pillow. More for show than use due to "Petals" possible getting "smushed". Was a little disappointed in lack of contrast in colors, as shown on my monitor. Option: Light grey - 18" x 18"
Option: Dark Grey - 18" x 18"
Love the pillow. Attractive, well made, color true to website. I am pleased with the quality. It is well-made, and the color is very pretty. This was cute but the colors are rather muted and the fabric is almost felt-like. Prefect for my secetional. fits perfect in the rounded corner! very happy with it. Option: Maroon - 18" x 18" | Taupe - 18"x 18"
"is the red color accurate. some say it's pink? I need red." I bought a set of orange ones and the color is very faded looking. I was a little disapointed since it doesn't match as well as I'd like. But the product is very well made.